TANZANIA–Down a quiet street in an affluent suburb of Dar es Salaam lies a sprawling one-story house. Nestled behind a high security wall and surrounded by lush palm trees, it is hard to believe that this is a crucial location in Tanzania’s war on poaching. A rusted metal cage with plywood benches sits in the backyard and serves as a makeshift detention center. Inside, the house’s bedrooms have been transformed into interrogation rooms and offices for Tanzania’s elite anti-poaching taskforce. The group, which was formed in 2012 at the peak of Tanzania’s poaching crisis, is one of the subjects of the newly released Netflix documentary The Ivory Game. The film, directed by Kief Davidson and Richard Ladkani and executive produced by Leonardo diCaprio, details the devastating effects poaching has had on Africa’s elephants. Since the early 2000s the country’s elephant population has plummeted. The latest data suggests that since 2009 the population has fallen by almost two-thirds, from 109,000 elephants to just 43,500 in 2014. The dramatic decrease in numbers is the result of increased demand for ivory in Asia, where elephant tusks are carved into decorative ornaments. At the taskforce headquarters the outlook on the current poaching situation is surprisingly optimistic. A fleet of new LandCruisers sits in the parking lot, ready to be deployed, as officers busily comb over new evidence from a recent ivory bust. The task force is led by Elisifa Ngowi, a 74-year-old intelligence specialist whose four-decade career has taken him from the slopes of Mount Kilimanjaro to Pyongyang, North Korea, to Damascus, Syria and back. Ngowi worked on some of the biggest cases in Tanzania’s history, including the 1998 U.S embassy bombing in Dar es Salaam. Sitting behind his big messy desk, Ngowi looks like what he is, a grandfather, but his intense marble eyes hint at a quiet intelligence and fierce determination. He likes to joke that he’s spent the last ten years trying to retire, but he couldn’t pass up the chance to try to save his country’s remaining elephants. Elisifa Ngowi, the 74-year-old intelligence specialist leading Tanzania's anti-poaching effort. Ngowi currently leads a team of 120 officers from various Tanzanian law enforcement agencies, including the police, military and immigration under the country’s National and Transnational Serious Crimes Investigation Unit (NTSCIU), which is commonly referred to simply as ‘the task force’. While the taskforce started looking into poaching in 2012, it wasn’t until 2014 that results started coming in. One of those places was the Selous Game Reserve in southern Tanzania, once the home of the biggest populations of savannah elephants, the largest subspecies of elephant. The Selous Game Reserve in southern Tanzania was once home to some of the largest populations of elephants in Africa. Today’s population is just a fraction of what it once was, however, because of anti-poaching efforts, the numbers are stabilizing. Data collected from the Tanzania Wildlife Research Institute (TAWIRI). The taskforce uses an intelligence-based approach that involves officers going undercover in villages for long stretches of time. “We send a team of four to six officers who have to stay in that area living among the communities with nice cover stories, pretending to be doing some business that is commonly done in that area,” explained Ngowi. Once the officers successfully infiltrate the villages they start befriending suspected poachers, slowly figuring out who they are and how they go about their business. The information gathered from the field is reported back to Ngowi every month and entered into the NTSCIU’s mega poaching database. The extent and specificity of the information they gather is key to the taskforce’s success. The team uses the information gathered in the villages to form a picture of the larger poaching syndicates that operate across Tanzania and East Africa, and even Asia. “The poacher in the bush leads us to the transporter who comes to pick up the ivory. Then the transporter leads us to the traders in the cities, and from the cities we go international to the big players,” described Ngowi. Once enough evidence is gathered on a certain network, the taskforce will carry out arrests. It can be a dangerous job. James Nchimbi works for the taskforce south of the Selous Game Reserve near the border of Mozambique, an area that has been hit hard by poaching. Nchimbi is solidly built, with broad shoulders and a slight belly. He has a round face and gentle smile that belie his intensity. He’s fearless in his pursuit of poachers. He has helped take down some of the country’s most notorious killers of elephants. Nchimbi has been injured several times in his pursuit of poachers, but for him and other field operators the chance to arrest bad guys for outweigh the dangers. Over the last year, the NTSCIU has arrested some of the world’s biggest ivory traffickers, including a Chinese grandmother who was dubbed the “Queen of Ivory.” Yang Feng Glan, 67, whose case is currently on trial in Dar es Salaam, is charged with smuggling 706 elephant tusks and leading a criminal network. If convicted, she could face up to 40 years in prison. The taskforce had been on Yang’s trail for over a year, closely following her moves using high-tech surveillance equipment. A month after the taskforce arrested Yang, a key piece of intelligence led the team to make another big arrest. On October 31, 2015, officers with the taskforce caught Boniface Matthew Mariango, known to them as “Shetani” (meaning “the Devil” in Swahili)—one of the top ivory traffickers in Tanzania and a supplier to Yang. Taskforce investigators allege Mariango managed more than 15 poaching syndicates which operated throughout Tanzania, Burundi, Zambia, Mozambique, and Kenya. The force’s third big victory came last June when it took down another large network in Tanzania and seized 1.4 tons of elephant tusks in Dar es Salaam. Those arrested included several big players from Uganda and Guinea who frequently traveled to China and Vietnam to orchestrate large shipments of ivory from Tanzania. Ivory Bust: Ivory discovered by NTSCIU officers in June in a stash house in Dar es Salaam, Tanzania's economic capital. Along with these ivory kingpins, the NTSCIU has arrested more than 1,200 poachers and their associates since 2012. But to Ngowi and his team, making arrests is only a small part of stopping the slaughter. “We’ve been working closely with Tanzanian prosecutors on the cases to make sure that justice is carried out,” said Ngowi. According to their data, the taskforce currently has a conviction rate of 84%. Since 2013 there’s also been a significant increase in both sentence length and fines handed down by Tanzanian judges for wildlife crimes. Fourteen individuals arrested by the taskforce have been sentenced to more than 20 years in prison for wildlife related crimes, with two sentenced to the maximum sentence of 40 years. “Heavy sentences give a clear message that this is a serious crime,” said Wayne Lotter, the director of PAMS Foundation, a conservation group that helps fund the taskforce. Since 2012, the NTSCIU has arrested hundreds of traffickers, poachers and their associates. While taking down poaching networks, the taskforce has also seized hundreds of firearms, ammunition and vehicles used for poaching and taken millions of dollars worth of ivory away from traffickers. Data provided by NTSCIU. Ngowi estimates the ivory kingpins and their networks were responsible for the deaths of tens of thousands of elephants in East Africa during the last decade. With poaching syndicate leaders behind bars, there’s been an evident decrease in poaching in Tanzania. A recent aerial survey of Africa’s elephants indicated an extremely high carcass ratio for Tanzania, however, only 1% of the carcasses were fresh (having flesh still attached). These findings suggest that most of the elephants were killed within the last five years and that the killing had greatly decreased when the survey was done over 2014 and 2015. 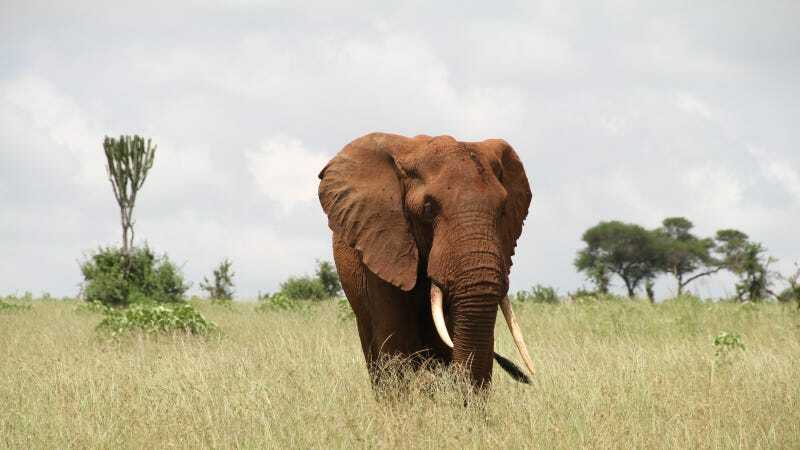 NTSCIU rangers on patrol are also reporting fewer carcass sightings as well as an increase in cases of "human elephant conflict," such as elephants raiding farmers’ crops. Conservationists take this as as a good sign. “It indicates that elephants are moving back into areas where they previously were absent for some time due to intense poaching,” said Lotter.